Your goals may be different but one that we have in common should be to form new healthy habits! We will 'meet' every week for eight weeks on Mondays, here on the blog. If you do not want to share your information on the blog you are more than welcome to email me privately at paulamw@comcast.net. Also if you do not want your standings published on the blog please let me know I will keep them between you and I. Each week you are going to be assigned a LIFE HABIT, it will be revealed on Saturdays. 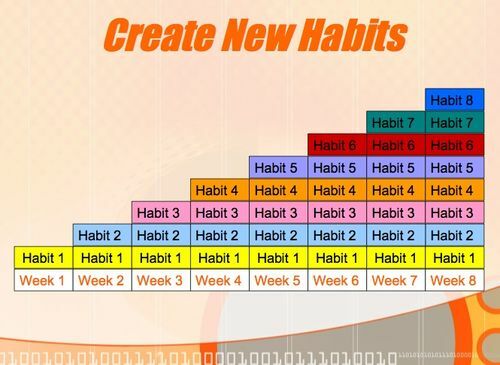 It will be your assignment to incorporate this one new habit for the following week. A new LIFE HABIT will be assigned the next week, while carrying over the previous week's habit... and so on, until all eight habits are in place! POINTS! There are rewards! Each participant will receive a 'point' for each habit they complete for each day. At the end of the eight weeks, everyone who has accumulated 80% of the total possible points will receive a secret gift! We are on the honor system here! Remember the saying "...you are only cheating yourself." Now I know that some of you have a competitive streak (myself included) so I would like you to decide if we should have First, Second and Third prizes for the most points? I am willing to do this but also want this to be a group decision. I will be referencing the products [Advocare] I use and the food I eat - you do NOT have to use the same products to participate. In fact, if you feel comfortable please feel free to share in your comments what you are doing. What are your best practices? Is there an eating or exercise plan? Each LIFE HABIT will incorporate eating guidelines. However, from start to finish, use the "common sense" eating plan. Exercise is encouraged but it is your option! I will be sharing my exercise experiences with you as I train for my 5k in March. I am just like you and don't pose to be a health expert. I want to share my experiences with you and it's always more fun in a group right?! If you are under a doctor's care for any medically related issue, please consult with your doctor before changing diet, exercise, or supplement program. Please adhere to their directions and any product labels. Looking forward to this second round with you!! !